Randy started Singer Davis (then the Singer Legal Group) as a one-man-shop in 2009 and continues serve as the firm’s managing partner. He has more than twenty years of experience as a trial lawyer and has served as lead counsel on numerous high-profile cases. His history includes thirteen years of litigation experience at Willcox and Savage, a 60-person firm in Norfolk, Virginia, where he served as head of the firm’s litigation section. Randy is also a bestselling and award-wining novelist with fourteen books in print and he serves as Pastor at Trinity Church in Virginia Beach, a church that has grown to over nine hundred in attendance in three locations since its founding in 2007. 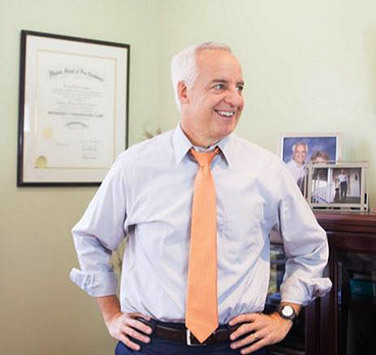 Randy graduated second in his class from William and Mary Law School and has been practicing law since 1986. He served as lead counsel in Farley v. Guns Unlimited, the first Virginia jury trial to receive gavel-to- gavel television coverage. He also served as lead counsel in the case of Miller v. Somerville, successfully representing the daughters of Hamilton Somerville in their quest to prove that their father had been poisoned by their stepmother. The Lifetime movie Widow on the Hill, and a 2016 Vanity Fair Confidential television episode of the same title, chronicled the circumstances of Hamilton Somerville’s death and his daughters’ quest for justice. His trial experience includes several trials that lasted multiple weeks and a few that lasted several months. He has litigated product liability cases (the crash of an A-6 Grumman attack plane), commercial cases (representing a popular cable network in a massive patent and shareholder suit), environmental cases (representing a railroad in the clean-up of a CERCLA site), medical malpractice cases (death of a patient from an undiagnosed ectopic pregnancy) and criminal cases (representing an off-duty police officer charged with malicious wounding and attempted murder). In addition to his active litigation practice, Randy also serves as Attorney in Residence and Director of the Singer Civil Litigation Practicum at Regent Law School. For the past five years, he has been named to Virginia Business Magazine’s list of “Legal Elite” litigation attorneys and has been named one of Virginia’s “Super Lawyers” in the area of civil litigation. He is presently listed by Super Lawyers (a peer reviewed rating) as one of the top 100 lawyers in Virginia. About fifteen years ago, Randy began pursuing a passion to write. Tapping into his courtroom experience, Randy pens legal thrillers designed to entertain his readers while confronting them with controversial ethical and moral themes. His first novel, Directed Verdict, won the prestigious Christy award in 2002. Randy was also named a finalist, along with John Grisham and Michael Connelly, for the inaugural Harper Lee Prize for Legal Fiction sponsored by the American Bar Association and the University of Alabama Law School. In 2015, his first stab at historical fiction, The Advocate, won the award for the year’s top Christian novel. When Trinity Church was launched in Virginia Beach in 2007, the leaders asked Randy (who had been serving in leadership at the North American Mission Board) to come on board as the Teaching Pastor. In nine years, the church has grown to over nine hundred in attendance across three campuses and is involved in ministry work in various parts of the world. Randy has told the church that he is willing to continue serving as Teaching Pastor until they find somebody who actually knows what they’re doing. In the meantime, he is a preaching lawyer: proof positive that God has a healthy sense of humor. We are a Virginia Beach law firm with a commitment to excellence, zealous advocacy, and client service. © 2017 SINGER LEGAL GROUP. ALL RIGHTS RESERVED.